Made a yummy meal the other day. It was supposed to be an after work thing, but I got out late and we made it a weekend dinner instead. Using the magazine I posted about earlier, I made their weeknight roast chicken, my fiancé loves roast chicken, so I was sure he’d enjoy that part at least. It was simple enough, rinsed it off, coated it with a tablespoon of olive oil, then rubbed it with some salt and pepper and popped it into the oven with a thermometer in the breast. While it rested once it finished, I fried up some fresh corn and popped the biscuits into the oven. He’d arrived and helped make the pan sauce. The verdict: Hard to capture on camera, but tasted far better than it looked. The biscuits were a tad overdone, but I liked the basic flavor. The fried corn was a new experience for me and I could have lived with a little less pepper. The chicken was perfect (and so simple too)! I shall be making that a lot, he couldn’t stop raving, that’s when I know it’s really good. 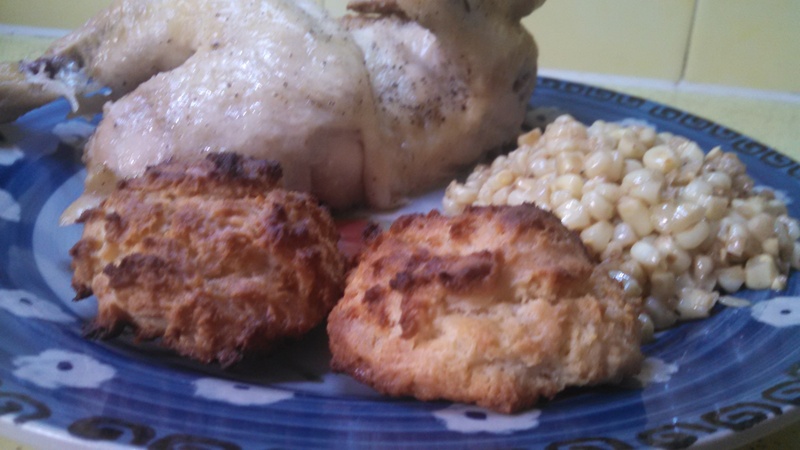 This entry was posted in Chicken and tagged Biscuits, fried corn, roast chicken, whole chicken. Bookmark the permalink.